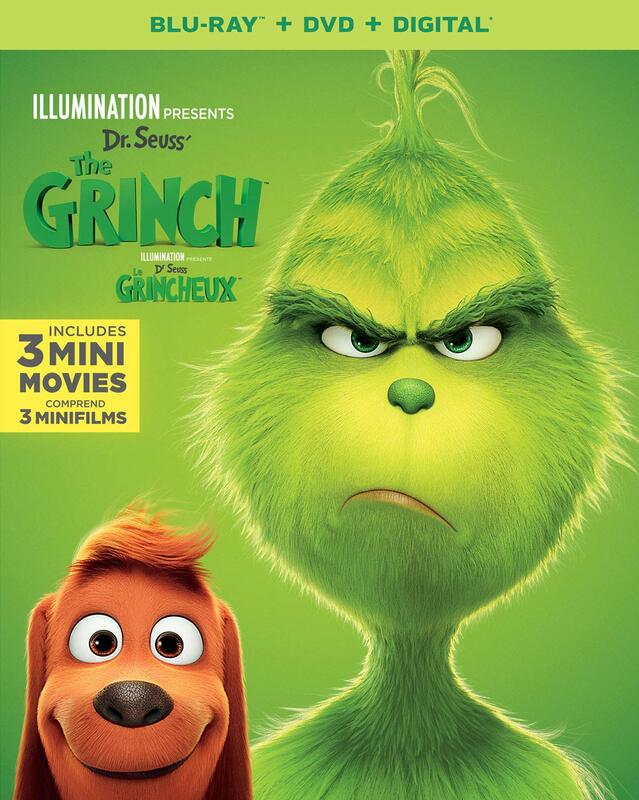 After becoming a smash hit at the box office throughout the holiday season, Illumination’s surprisingly great animated Dr. Seuss adaptation The Grinch is being released on Blu-ray this week. I really enjoyed this one when I first saw it at a screening back in November, and it’s actually grown on me quite a bit since then. I saw the film twice in theatres, going again just before Christmas, and I’m confident in saying that this is not only the best feature length adaptation of a Dr. Seuss story that we have gotten to date, but also Illumination’s finest production as well. The animation is beautiful, and Benedict Cumberbatch does a great job of voicing the title character, but the film really succeeds thanks to the genuine feeling that the filmmakers have brought to the story, offering a surprisingly touching study of depression and loneliness that gets to the heart of why the Grinch doesn’t like Christmas and finds it too painful to celebrate. For more on the film itself, you can read my full review right here. The Blu-ray comes with an array of bonus features, including a trio of brand new mini-movies. First up is Prison Break, which makes great use of physical comedy as two Minions get dragged into an elaborate jail break. Next is The Dog Days of Winter, an almost entirely wordless piece that finds Max venturing out into the snow to get tea for a sick Grinch. It offers a wonderful showcase for Max’s facial expressions, which were one of my favourite touches in the film. Finally, Santa’s Little Helpers amusingly follows a trio of Minions who accidentally end up at the North Pole and pass themselves off as elves, but end up wreaking havoc instead. They are followed by a featurette entitled The Making of the Mini-Movies, which sheds more light on the collaborative process behind the production of these shorts, and how they allow emerging talents at the studio to come into the spotlight. There is also a selection of other bonus features that explore different aspects behind the making of the film itself. First up we have the aptly titled From Green to Screen, an engaging piece that explores how they fleshed out the book to feature length, mainly focusing on the genuine emotion that they brought to this adaptation through the Grinch’s heartbreaking backstory. Next up, Illuminating the Grinch explores how the animators brought Dr. Seuss’ unique visual style and distinct use of colours and asymmetrical shapes to the screen; My Earliest Grinch Memories features members of the cast and crew sharing their memories of when they were first introduced to the story as children; Grinchy Gadgets looks at some of the many gizmos that the Grinch uses to aid in his holiday heist; and Songs From His Little Heart is a piece about the use of music in the film, mainly focusing on composer Danny Elfman’s wonderful score. These are accompanied by Any Who Can Draw, which features head of story Mark O’Hare showing us how to draw simple doodles of three of the characters (The Grinch, Max, and Fred); X-Mas Around the World, which offers as a brief look at some of the odder seasonal traditions from different countries; Cindy-Lou’s Yule Log, which is an eight minute video of a blazing fireplace surrounded by decorations that the Grinch keeps popping in and stealing; and finally Production Babies, which is essentially just a list of first names of all the babies who were born during the making of the film. The lyric videos for the songs “You’re a Mean One, Mr. Grinch” and “I Am the Grinch” by Tyler, the Creator are included as well. Finally, the bonus features section also has a tab marked Who’s Who in Who-Ville, which takes us to a separate menu that offers a substantiative and interactive assortment of character profiles, animation tests and photo galleries devoted to the Grinch, Cindy-Lou Who, Fred & Max, the Head Whos and Cindy-Lou’s Crew, divided into five different chapters. While Universal will likely reissue The Grinch sometime down the line with more Christmas-themed cover art, this is still a solid release of a surprisingly excellent animated film from last year that I already look forward to revisiting around the holidays. The film is sure to become a perennial favourite in many homes, and it’s well worth adding to your collection. The Grinch is a Universal Pictures Home Entertainment release. It’s 86 minutes and rated G.